Or shall we take what the religious hierarchy says about these heretics? Going all the way back to Arshakavan,** the Paulicians and the Thondrakians. Persecution, and murder, be it physical or spiritual? Do you think the Inquisition/Հաւատաքննում is a foreign concept of the Dark Ages? The conventional wisdom is that Komitas lost his mind and spirit as a result of The Genocide. But see the letter he wrote to the then Catholicos HH Mattheos II in 1909, 6 years before 1915. An his reference to the Դպրաց Դաս/Church Choir in Polis. In those days the Church Choir (class of scribes) would be all male as (unclean) women were banned from the altar. Look at it today; Not only the choristers are mostly female, but their choirmasters and organists (Hi Florence Avagian) are also women. This was written 2 years after his mentor, godfather Khrimian Hayrig had died (1820-1907), and Madtheos II aka Madtheos Kostantnupolsetsi(1845 Polis-1910 Ejmiatsin ) was the Amenayn Hayots. (One year, 1909-1910). Please allow me to translate the desperate and heart wrenching letter below. Your Holiness, for over 20 years I have been a monk at the Holy See of Ejmiatsin. I have entered it with the intent to serve During these 20 years the environment has not allowed me to perform at my best. I have only seen conspiracy, not justice. My nerves have weakened, I cannot endure it anymore. I am searching but I cannot find any comfort. I am thirsty of noble work, I am distracted and I desire to stay away, plug my ears to not hear (tie my feet), clos my eyes to not see to not stumble (and sin) , to rein my sentiments, as I am also a man, my conscience is dying, my fervor is cooling, my life is wasting, only hesitation is nesting in the depth of my heart and soul. If it pleases Your Highness to not lose me, and rediscover me, I tearfully plead , release me of oat h of monkhood at Holy Ejmiatsin, instead assign me to the Solitude at Sevan. I lost (sic wasted) 20years (here), if only I could live/gain the rest (of my life) and write the fruits of my studies in peace, just as an added my tribute to Our Holy Church and Knowledge. Նկար 1. Կ.Պոլիս, 1914 թ.
Նկար 2. Կոմիտասը աշակերտների հետ։ Ձախից աջՙ Հայկ Սէմէրճեան, Միհրան Թումաճան, Վարդան Սարգսեան, Արտաշէս Ապաճեան, Վաղարշակ Սրուանձտեան, Բարսեղ Կանաչեան, Պոլիս, 1914թ. Edited by Arpa, 23 April 2012 - 09:59 AM. that had invaded and settled in the country throughout its history. Armenian heart is not ours alone. It is Syrian and Indian and Persian. founder and conductor of an acclaimed national choir. Armenians in the audience, who understood the words, to tears. 20 years of his life in total silence in a mental institution in Paris. understood, if a trifle too long and repetitious. it helps if you're Armenian. 19th. Call (818) 551-1234 for reservations. * Citron is Los Angeles bureau chief of San Diego Jewish World. The following is an essay by Ajarian, a testimony to the human side of Komitas. I don’t know when Hrachya wrote the essay. It begins in the year 1899 when Komitas (b-1869) would have been about 30 years old and Hrachya (b-1876) would be about 23 and tells about their association of several years as instructors at the Gevorgian Academy. This is a test to seen if I can master the the “new and improved?? ?” HyeForum format. Now that it seems I may have overcome the obstacles set by this “new” HyeForum system, I will once again attempt to post the article in full. Above I said that we don’t know when the article was written, judging from the last paragraph it is evident that it was written after 1935, after Komitas’ demise. And that their association lasted 3 years. Also note in the paragraph before the last, Ajarian cites several reasons for Komitas’ loss of his mind, the loss and destruction of 15 years his blood and sweat research of classical Armenian musical notations. In previous posts I alluded to my suspicion to harassment and persecution, both at Ejmiatsin and Bolis. Այս հանկարծական և համարձակ պատասխանի վրա կաթողիկոսը զարմացած և ուրախացած հարցնում է.
http://asbarez.com/arm/143132/ - Asbarez News - Armenian Edition - http://asbarez.com/arm - ԿՈՄԻՏԱՍԻ ՀԵՏ ԹԱԳՈՒՀԻ ԱՐԶՈՒՄԱՆԵԱՆ* ---- «Ինձ համար չկայ ուրիշ երկինք, քան իմ ժողովրդի հոգին» ԿՈՄԻՏԱՍ  ---- Գարեգին Լեւոնեանի յուշերում կարդում եմ Կոմիտասի անձնական նկարագրի մասին մի դրուագ: Միջահասակ, նիհար, ջղուտ եւ զգայուն, դէմքը՝ դեղնաւուն, աչքերը՝ արտայայտիչ եւ վառվռուն, գլուխը՝ ճաղատ, մօրուքը՝ ոչ «վարդապետավայել», այլ՝ ծնօտի տակ միայն թողած, ինքը արագաքայլ եւ անհամբեր, միշտ շտապող, միշտ աշխատասէր, կեանքից գոհ, լաւատես: 1869թ. սրբօրէն բեղուն եղաւ հայոց աշխարհի համար. ծնուեց հայ երգի Մեսրոպ Մաշտոցը՝ մեր Կոմիտասը: Աստուածաընտրեալ հանճարը դարձաւ մեր ազգային կոմպոզիտորական դպրոցի հիմնադիրը: Նա ե՛ւ երգիչ էր, ե՛ւ երգահան, ե՛ւ երաժիշտ բանահաւաք, երաժշտագէտ, մանկավարժ եւ խմբավար: Կոմիտաս վարդապետը ժողովրդի պատմութեան եւ հոգեբանութեան խորիմացութեամբ, ազգագրագէտի վարպետութեամբ, գեղագէտի պահանջկոտութեամբ, գիտնականի վերլուծական մօտեցումով հաւաքեց ու մշակեց հազարաւոր ժողովրդական երգեր: Նրա ծառայութիւնը ոչ միայն համազգային, այլ համամարդկային նշանակութիւն ունեցաւ: Կոմիտասն իր ստեղծագործութեամբ, գիտական տեսական հետազօտութիւններով շրջադարձային դեր խաղաց ազգային երաժշտական մշակոյթի զարգացման գործում, եւ միայն իրեն յատուկ հանճարով կանխորոշեց նրա արագընթացի ուղիներն ու հեռանկարները: Ինչպէս Դերենիկ Դէմիրճեանն է ասել՝ «Կոմիտասը վէմն է հայ երաժշտութեան, հիմնաքա՛րը: Կոմիտասը այն իմաստուն ստեղծագործն է, որ մեծապէս հասկացաւ ժողովրդական աղբիւրների կենսալից ուժը եւ իր նիւթը վերցրեց այնտեղից»: Ինչպէս Աւ. Իսահակեանն է ասել. «Կոմիտասը հայ երգով լոյս աշխարհ հանեց դարերի խաւարի մէջ կեղեքուած ժողովրդի խուլ բողոքն ու ցասումը բռնութեան, ստրկութեան դէմ նրա խեղդուած վիշտը, իրաւազուրկ կեանքը եւ պայծառ ապաքայի հանդէպ տածած հաւատը»: Մեծանուն երաժիշտ Տիգրան Մանսուրեանի բնորոշմամբ՝ «Կոմիտասը համաշխարհային երաժշտութեան մէջ առաջիններից էր, որ ներկայացրեց 20րդ դարի երգահանի կերպարը»: Իսկ Վիեննայի համալսարանի երաժշտութեան դասախօս Էգոն Վելեշը գրել է. «Այն բոլոր երգերը, որ ես անցամբ լսել եմ Կոմիտասից եւ կամ ուսումնասիրել եմ, ամէնից առաջ մի բան են ապացուցում, որ Կոմիտասը եզակի դէմք է՝ որպէս ներդաշնակող, որպէս պոլիֆոնիստ»: Յովհ. Շիրազն այսպէս է նկարագրել Կոմիտասի ծնունդը. «Անցնում ես դաշտերով՝ կանաչ-կանաչ, խոտ, խոտ, խոտ, բայց ահա մի ծաղիկ, դարձեալ խոտ, անսահման կանաչութիւն, բայց ահա մի բոյլ կակաչներ, մի աստղաբոյլ մեխակ ու վարդեր, որոնք նեկտարով են ողողում դաշտերի դառնութիւնը»: Եւ ահա 1915թ. երկինքը փուլ եկաւ՝ իր փլատակների տակ առնելով մորթուած սերունդներ, արնաներկ հողեր ու ջրեր, սովալլուկ ու ցաւատանջ մանուկների խեղդուած հեծկլտոց, ուժասպառ ծերերի աղօթքի մրմունջ, ցամաքած ստինքներով երեխամայրերի նուաղող հառաչանք, քարերով ջախջախուած հանճարներ, գլուխներ, գետը նետուող կոյսեր… Այս ահազդու արհաւիրքին չդիմացաւ ու խելագարուեց մեր յոյսերի ու վշտերի անմար գանձարանը՝ Կոմիտասը: Խելագարուեց բոլորիս փոխարէն, բոլորիս համար, նաեւ այն բանի համար, որ ինչպէս Սեւակն է ասում՝ «խելքներս գլուխներս պահենք՝ խելօք ապրելու, խելօք գործելու եւ խելօք մեռնելու՝ յանուն այն ազգի, որ կարող է կոչուել… կոմիտասեան»: Ակամայից ուզում եմ մէջբերել մի յուշ: Մի անգամ Կոմիտասի մտերիմներից՝ Փարիզի հայոց առաջնորդ Վռամշապուհ Քիպարեանը այցելում է հոգեբուժարան՝ մեծ երաժշտին տեսնելու: Նկատում է, որ հոգեբուժարանի պարտէզում, մի ծառի տակ հանդարտ նստած է Կոմիտասը, իսկ ջութակահար Թորգոմը՝ Աղաւնի Մեսրոպեանի փոքր եղբայրը, իր լարային քառեակով Շոբերտի մի եղանակն է նուագում: Նուագի առաջին մասը հազիւ վերջացած՝ Կոմիտասը նստած տեղից վեր է ցատկում եւ ծառի ճիւղը կոտրատելով՝ գոռում է. - Ո՛չ, այլեւս չեմ ուզեր լսել. Բա՛ւ է, բա՛ւ է. ամօ՛թ ձեզ: Ես կարիք չունեմ դրանց…: Ո՞ւր էք կորցրել դուք իմ երգերը… Անշուշտ, Կոմիտասն իր երգերն էր ուզում՝ դեռեւս Բերլինում ուսանելու տարիներին. - Ուրիշն՝ ուրիշին, Ես իմը՛, իմը՛, ի՛մն եմ ուզում, Իմը՜, դուք հասկնա՞ն…: Ու չէր աւարտում «հասկանում էք»ը: Կոմիտասն ունէր մի այլ մտատանջութիւն եւս. «Ամբողջ մտատանջութիւնս է հասցնել աշակերտներ, որոնք դպրոցների մէջ մեծ տեղ գրաւեն, նուիրուեն ազգային երաժշտութեան ուսումնասիրութեան, տարածեն ժողովրդին մէջ հայ երաժշտութեան ոգին, որպէսզի ժողովրդի մէջ ազգային երաժշտութեան խօսքը մարմնանայ»: Այսօր իրականութիւն է դարձել Կոմիտասի բաղձանքը: Այդպիսի դպրոցներից մէկն էլ «Լարք»ն է՝ կրթօջախ, որտեղ ուսանողը հնարաւորութիւն ունի յղկելու եւ մշակելու իր երաժշտական ընդունակութիւնները ու հարստացնելու իր ներաշխարհը: Բարձրորակ եւ նուիրեալ մանկավարժների միջոցով, այստեղ կերտւում է վաղուան հայ երիտասարդը՝ երաժշտական բարձր պատրաստուածութեամբ, ազնիւ ու հայեցի նկարագրով: Այս մասին էր վկայում Մարտի 16ին «Լարք»ում իմ առաջնորդութեամբ կազմակերպուած աւանդական հայ երաժշտութեան երեկոն, հովանաւորութեամբ՝ Հիւսիսային Ամերիկայի Արեւմտեան թեմի առաջնորդ գերաշնորհ սրբազան Յովնան արքեպիսկոպոս Տէրտէրեանի: Համերքին մասնակցում էին նաեւ միջազգային ճանաչում ունեցող կոմպոզիտոր Տիգրան Մանսուրեանը, «Համայնապատկեր» ամսագրի գլխաւոր խմբագիր Սարօ Գիւդակեանը, բանաստեղծ-առակագիր Ժորա Կարապետեանը, դոկտոր Սիլվա Քարայեանը եւ բազում այլ հիւրեր, ծնողներ, մանկավարժներ, ուսանողներ: Համերգը նուիրուած էր Կոմիտասին, հայ երաժշտութեան արքային: Ելոյթ ունեցան «Լարք»ի ուսանողները՝ դաշնամուրային եւ ջութակի կատարումներով, երգչախմբերը, ձեռնազանգակների եւ հարուածային գործիքների համոյթները, նաեւ 12 սաներից կազմուած ասմունքի խումբը՝ իմ ղեկավարութեամբ. անոնք 20 րոպէ տեւողութեամբ պատշաճ ձեւով ներկայացրին Սեւակի «Անլռելի Զանգակատուն»ից հատուածներ: Յուզիչ էր, երբ նրանք իրենց իսկ շուրթերով արտայայտում էին. Դու չիմացար, Եւ որտեղի՞ց իմանայիր Մինչդեռ հիմա, հիմա… նայի՜ր… Քանի՜ աջիկներ, մանչուկնե՜ր քանի, Քանի՜ նորատի, պարման պատանի՝ Աչքները սեւսաթ, դէմքները սուտակ, Ձեռքներին սրինգ, շեփոր ու ջութակ, Դպրոցից գալիս դպրոց են գնում՝ Պայուսակներում ու թեւերի տակ, Քո երգ ու տաղի պրակները տաք… - Դէ ե՛կ, Վարդապետ, ե՛կ ու հաւատա՛: Հաւատա՛, որ այս օտար ափերում իր լոյսն է սփռում «Լարք» հաստատութիւնը, որի հիմնադիրն է մեծ երաժիշտ Վաչէ Բարսումեանը եւ որի վառած ջահը անմար կը մնայ հայ մշակոյթի, մասնաւորաբար՝ «Լարք»ի պատմութեան էջերում: Հաւատա՛, որ այստեղ կրթւում է մի սերունդ, որին կարող ենք վստահել մեր մշակութային ողջ ժառանգութիւնը. մի սերունդ, որ օժտուած է մշակոյթով ապրելու եւ յարատեւելու ներքին մղումով. մի սերունդ, որն ունի անվերջ ուսանելու եւ զարգանալու տենչը, հաստատակամութեան ոգին՝ եղածով չբաւարարուելու, այլ աւելի՛ առաջադիմելու համար. մի սերունդ, որ ունի ազնիւ ու հայեցի նկարագիր, որն էլ ողջ կեանքում շող է տալու նրանց կոմիտասեան ոգեղէն դիմանկարին: Ողջ երեկոյի ընթացքում մեզ հետ էր Կոմիտասը՝ «Ձայների արքան», իր ստեղծածի նման անսասան ու բարի հայեացքով շոյելով լարքականներին՝ նրանց, որոնք մէկ անգամ եւս հաստատեցին, որ, այո՛, կարող են խելաքարութեան հասցնել Կոմիտասին, բայց չեն կարող սպաննել Կոմիտասը: Կոմիտասը ամէնից ապրողն է բոլոր ապրողներիս մէջ: Կոմիտասը ապրում է ուսանողներից իւրաքանչիւրի մէջ: Եւ ինչպէս Նաիրի Զարեանն է գրել՝ Դու հարազատ ես իմ ճարտար ու տքնաջան ժողովրդին, դարերի գանձը մեզ բերող կամուրջը կա՛յ քո երգերում: Աղբիւրի պէս կարկաչելով կ՛երթաս քո ծովն ապագայ: Անմահական գարուն ես դու, աշուն չկայ քո երգերում: Եւ ինչպէս Յովհ. Շիրազն է գրել՝ Թէ չծնուէր մեծ Կոմիտասն իմաստուն՝ Հայ ժողովուրդն այսքան բարձր չէր լինի, Թէ չլինէր հայ ժողովուրդն աշխարհում՝ Կոմիտասն էլ այսքա՛ն քաղցր չէր լինի: Article printed from Asbarez News - Armenian Edition: http://asbarez.com/arm URL to article: http://asbarez.com/arm/143132/ Click here to print. Copyright © 2010 Asbarez Armenian News - Armenian. All rights reserved. Above we saw how Komitas’ sensitive and fragile heart and soul was already bruised before that final Coup de Grace , the Genocide when he witnessed the brutal murder of his soul mates. Above we also saw how, given the time he would disavow his oath of celibacy and marry either Sona Yar or the soprano Margaret Babayan. **Why can’t I find any word or biography of him? Ashot was an accomplished musician, musicologist, composer and choirmaster in his own right. Apparently a student of Komitas at the Gevorgian Academy at Ejmiatsin. Here we see his obsession and inner secrets with worldly life, family, wife and children. When asked if he would continue his creativity, he answers- No, no not until I get out of here, join my wife and children, have my own home, I will not compose anymore- A Freudian slip? Here we see the somber side of his dark humor. When one of the visitors was presented as a poor, destitute and homeless, he answered- He can move into the next room that was recently vacated, here they treat everyone so humanely-. Կոմիտասը շատ վճռական կերպով պատասխանեց. Քիչ յետոյ ինքը դարձաւ մեզ եւ հարցրեց. - Հայր Սուրբ, հայկական երաժշտութի՞ւնն է գեղեցիկ, թէ՞ եւրոպական: Վարդապետը ծիծաղով պատասխանեց. Beside the heartrendingly sad songs, let us today listen to his more happy ones. ** Did you know that Komitas was born in the same year as his soul brotherToumanian and that they were in constant contact, where Komitas advised Hovannes to not use so many furkish words. **Today in spite of much attempt, Vagharshapat, most people still know it as Ejmiatsin. No, please Komitas did not write music like Dolmayi Par. Edited by Arpa, 26 September 2013 - 10:50 AM. 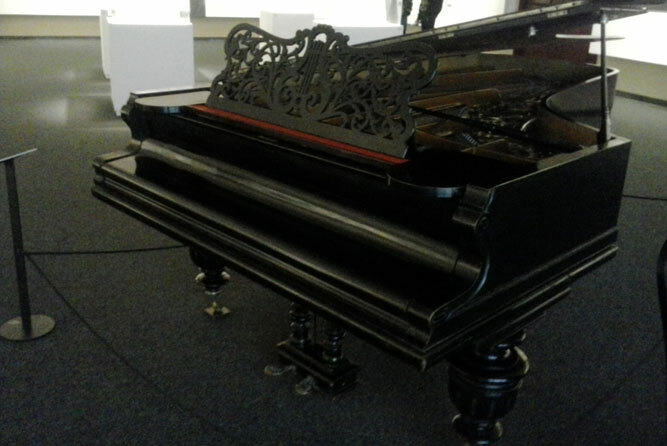 The Komitas Museum-Institute, which opened in January, received its most expensive exhibition piece from the Charents Museum of Literature and Artsthe grand piano Komitas himself used for composing. This journey, however, was not unswerving. For decades this pianos abode changed from one to the next before reaching its final resting place. And Komitas, the greatest Armenian musician, was deprived of the opportunity to have this legendary historical artifact for many years. It would have been unbelievable for the distinguished archimandrite Komitas to have given concert performances of his popular and spiritual songs and have led a choir with this instrument, but he actually composed on a tiny antique piano housed in Etchmiadzin congregation hall. That instruments keyboard was nowhere near substantial enough for Komitas. Its well known that Komitas dwelled with humble furnishings at the time, and even if he had the means, he wouldnt have spent anything on himself. Hovhannes Tumanians observations demonstrated just how modest his living situation was. One of Tumanians letters read: Someone like Komitas, whos even admired in Europe, is not able in his own country to obtain a piano and doesnt have the means to travel the regions to perform the work that only he himself can accomplish and that would bring so much glory to our nation. According to one legendary tale from Komitass life, the earnings from one of his concerts, amounting to 1,000 gold coins at that time, were donated to the state hospital. 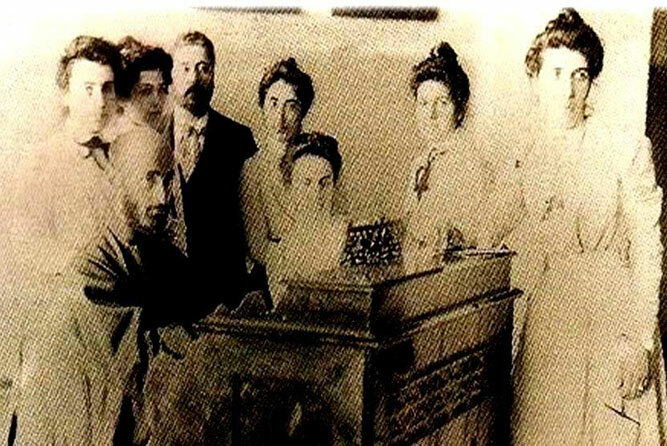 Imagine how great Komitass happiness and appreciation was when in 1907 the prominent Armenian entrepreneur and philanthropist Aleksander Mantashian gifted him an expensive piano. Incidentally, Mantashian was so impressed with the 27-year-old composers talent that he sponsored Komitass higher education in Germany. Now I have a big Schröder piano in my home. Youll know just how thrilled I am whenafter banging out on the piano puts the room topsy-turvy for the first time and people are sent on their wayIm left all alone. My eyes cant believe that Im finally becoming respectable and I have the proper conditions in which to work, and continue working. For a moment I was frozen in my own happiness, the torrent of tears began twirling in my eyes, and Imy heart, my mind and lifecalmed and became reconciled because I now have a way to work, a most imperative way. For many years multiple initiatives and organizations have exerted great efforts in finding the relics that belonged to Komitas in different parts of the world and bringing them home, including the legendary Schröder. Thankfully that has happened, and the display of the Schröder in the Komitas Museum-Institute is testimony to that dedication. It wouldnt necessarily be far-fetched for some to think that had Mantashian not been known for his own undertakings, his benevolence towards Komitas would have sufficed for his own place in history. YEREVAN, NOVEMBER 30, ARMENPRESS. Herman Makarenko – conductor of Ukraine’s national opera, artistic director and conductor of “KievClassic” orchestra, became the first Ukrainian to be named UNESCO “Artist for peace”. 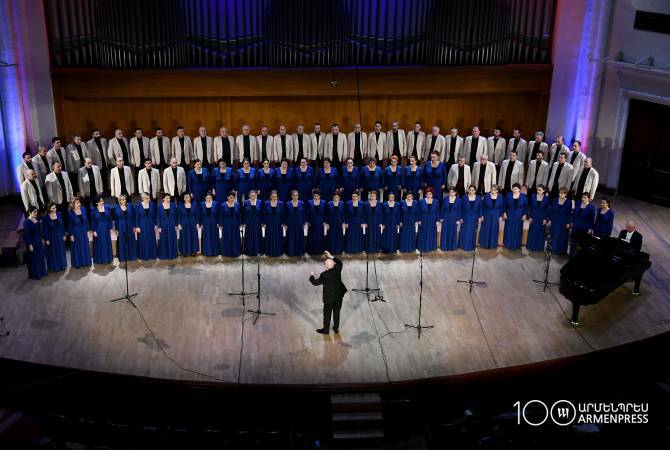 During the awarding ceremony in the UNESCO headquarters in Paris on November 29, works of famous Armenian singer/composer Komitas were played by the “Kiev-Classic” orchestra during a special concert program, Analitikaua.net reported citing the press service of Ukraine’s Union of Armenians. The Ukrainian conductor is famous for his permanent participation in large-scale musical projects organized by the Armenian embassy in Ukraine and the Union of Armenians. One of the latest concerts of Herman Makarenko was the evening-requiem dedicated to the 100th anniversary of the Armenian Genocide. I first heard the name of Halide Edib Adıvar in Turkey, in 1997, while on a tour, when the tour guide referred to the Genocide of Armenians as “The dark days of our country’s history” and stated that she had read Halide Edib’s writings. I then read a passage in a newspaper, on a meeting of Edib with Komitas [Gomidas] after the latter’s return from exile, in 1915. I kept this article and read it again when writing a book on Komitas’s mental state (see Komitas: Victim of the Great Crime, 2014). I subsequently bought Edib’s Memoirs of Halide Edib (2005), in which Edib writes not only about her encounter with Komitas but also about becoming the principal of the orphanage in Antoura (then Syria, now Lebanon) on the invitation of Cemal/Jemal Pasha; I knew about Antoura orphanage, having read my teacher’s, Karnig Panian’s memoirs of his childhood—from his native Gurin to the orphanage and more. Because I explore the psychological consequences of the genocide, both subjects interested me: Komitas’s mental state and happenings at the Antoura orphanage. 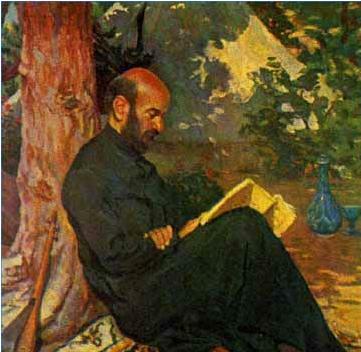 Reading her memoirs, the discerning reader notices the author’s tendentious, biased representations of Komitas, and Armenians generally, combined with a real appreciation of his art and work. We learn, for example, about Turk Ocak/Ojak, where Komitas was invited to perform a few weeks before his imprisonment. Edib writes, “It is in that hall that I came to know Goumitas [sic] Vartabet, the Armenian priest, musician, and composer. He was one of those musicians, actors, and lecturers of fame whom the Ojak invited to address its weekly audiences. Edib continues, “As he appeared in the long black coat of the priest, his dark face as naïve as any simple Anatolian’s, and his eyes full of the pathos and longing which his voice expressed in its pure strong notes, I felt him an embodiment of Anatolian folk-lore and music. Edib further writes, “Goumitas came from Kutahia and was of very poor parents. They knew no Armenian, and Goumitas learned it only in later life. His parents were probably of Turkish descent, from the Turkis who had joined the Gregorian church. The Byzantine rulers had called in Turkish tribes to form a barrier against the Saracenic invasions, and though these were mostly put along the southern frontiers, some might have moved elsewhere…. He was an Armenian nationalist whether his origin was Turkish or Armenian, but in temperament and heart he was a real Anatolian Turk if unconsciously…. Edib is correct that Komitas knew Turkish well; however, she is incorrect in stating that Komitas had collected his music in Constantinople. 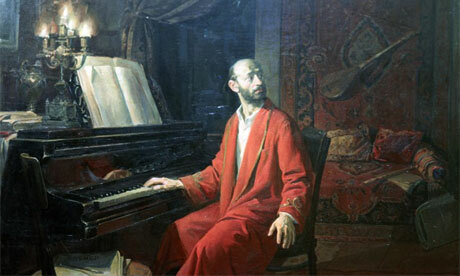 By the time Komitas moved to Constantinople, in 1910, he had already collected peasants’ songs in Eastern and Western Armenia as well as Anatolia. Kutahya Armenians spoke Turkish. Takouhi composed songs in Turkish. Kutahya Armenians, like many other Armenians in Turkey, were severely punished for speaking Armenian. Komitas’s familiarity with the Turkish language and the fact that he re-arranged the songs his mother sang in Turkish do not make him a Turk. He was an Armenian whose roots went back to the Tsghna Village in Koghtn county, Nakhichevan, formerly Armenian, now in Azerbaijan. Those views were not unique to Edib and Akchura. In March of 1915, at the Ojak, at the conclusion of Komitas’s performance, the audience composed of Turkish and non-Turkish music-loving society had sighed deeply; some had shouted, “May God protect him from the evil eye.” [Karakashian, p. 93]. The speaker of the day had stressed that the child of Anatolia, the Armenian priest, through his dedication and hard work, had given wings to Armenian music, presenting the folk songs he collected as Armenian national heritage, whereas Turkish clergy had not done that…. Goumitas one day sang an Ave Maria in Armenian which belonged to the sixth century, a thing of rare mystical beauty; and the utter ecstasy and religious emotion of the air so fascinated me that I asked him if he had set any of the Psalms to music. “Are you too tired to sing it?” I asked. He had thrown himself into the low chair near the piano, and his face was white and full of strange lines of pain. It was the cry of the hatred and vengeance of his soul for my people…. In 1915 the Ojak generously used its influence to have him spared from deportation, but in 1916 he had a serious disturbance in his mind, which gave way under the strain of those horrible times. Dr. Adnan begged Talaat Pasha to allow him to go to Paris for a cure, and this was accorded to him. He is still in an asylum. My book, Komitas: Victim of the Great Crime, of course presents the events differently, through research. Edib, H. A. (2005/1926). Memoirs of Halide Edib. A. Pankoff (Ed.). Karakashian, M. (2014). Medz Yegherni Zoheh. Yerevan: Dall. Karakashian, M. (2014). Komitas: Victim of the Great Crime. Yerevan: Zangak. Komitas Vartabed Gudinatsi (Michin Asya, Brusayi Marz), (Hounis 24), Inknagensakroutioun. The Julian and Gregorian calendars have a 12 days difference from 1800 to 1900, and 13 days after 1900. YEREVAN, JANUARY 30, ARMENPRESS. In new Armenia, people must be in real and constant relationship with arts and culture, national values must be close to people like a parent, a friend, PM Nikol Pashinyan said after witnessing how very few people have attended the “powerful” concert of the Armenian National Academic Choir in honor of the 150th anniversary of birth of Komitas. “Yesterday I and Anna went to the Armenian National Academic Choir’s concert dedicated to the 150th anniversary of birth of Komitas. 150th anniversary of birth of Komitas, National Academic Choir, conducted by National Hero of Armenia Hovhannes Chekijyan, superb concert. And – a semi-empty hall. This is the real face of our cultural life and policy. Ask anyone and they will say that Komitas, Chekijyan, and the Academic Choir are our national values. But the system is built in a way to make as little people as possible to interact with this national value. Because, this is high national value right, “it’s not for everyone”, masterpieces of art should be kept at the storages of museums (like rococo glasses kept in the closet”, because they are values and aren’t for daily use. As few people as possible must go to museums or not go at all. And so on..,” the PM said sarcastically. He emphasized that the cultural policy’s goal should be the elimination of this system. He says that the perception must be sowed as early as from school. “It is this very problem or group of problems that the ministry of education, science and culture must solve,” he said. The 39th Session of the UNESCO General Conference held in Paris, France has decided to include the 150th anniversaries of Gomitas and Hovhannes Tumanian in the UNESCO Calendar of anniversaries of eminent personalities and important events of 2018-2019.